The U.S. Department of Agriculture’s (USDA) National Institute of Food and Agriculture (NIFA) today announced $4.2 million in available funding to help eligible veterinarians repay a portion of their veterinary school loans in return for serving in areas of the United States lacking sufficient veterinary resources. Funding is made through NIFA’s Veterinary Medicine Loan Repayment Program (VMLRP), authorized by the 2014 Farm Bill. 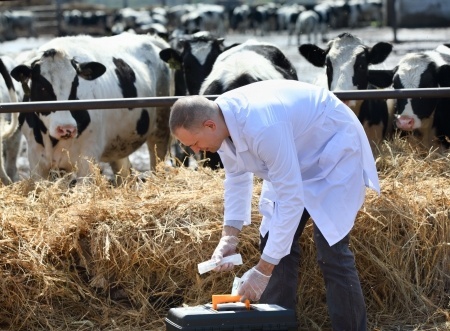 Studies indicate significant and growing shortages of food supply veterinarians. A leading cause of the shortage is the heavy cost of four years of professional veterinary medical training, which can average more than $150,000. Without the Veterinary Medicine Loan Repayment Program to help relieve that financial burden, many veterinarians might otherwise select more lucrative career options in the urban areas, such as companion animal care. Recipients are required to commit to three years of veterinary service in a designated veterinary shortage area. A map of veterinary service shortage areas by state is available online. Loan repayment benefits are limited to payments of the principal and interest on government and commercial loans received for attendance at an American Veterinary Medical Association (AVMA)-accredited college of veterinary medicine resulting in a degree of Doctor of Veterinary Medicine or the equivalent. Not have a federal judgement lien against his/her property arising from federal debt. The deadline for applications is May 26, 2017. Since the program was implemented in 2010, more than 300 veterinarians have helped fill shortage situations in 46 states. In a blog, Veterinary Medicine Loan Repayment Program Pays Dividends, two recent participants, Idaho-based veterinarian Annie Bowes and Kentucky-based veterinarian Tim VanDerPloeg, talked about the program’s impact to them and their communities.